This is a list of HDTV information for Reno, NV and Sparks, NV. For all of the OTA stations, any regular VHF/UHF antenna will work for HDTV channels; there is no such thing as an "HDTV antenna." There are only a few tower locations in the area; if you can get any of the analog stations, chances are good you can pick up the digital stations listed here, too. If you can't - such as out on the valleys - some of them are available for free on Charter QAM. This information is based on what I can pick up with a VHF/UHF antenna and off air HD tuner plus other information I can get my hands on. If you have any information that I'm missing or would like to add, let me know. Digial broadcasts use high VHF and UHF. This information also applies to anyone using a digital tuner including the digital switchover that occurred on June 12, 2009. If you do not have a digital tuner you will no longer be able to watch broadcast TV. I've personally been using a Samsung DTB-H260F set top box and a projector with some very basic rabbit ears since March, 2007. My information on this site is largely based off of my DTB-H260F and reader comments. Most HD satellite receivers and any recent HDTV set include ATSC tuners that can tune the channels listed here. Recently I've also been using SiliconDust's HDHomeRun tuners. An important distinction you should note between high definition and standard digital tuners is that all of the coupon-eligible digital tuners are not high definition (HD) in spite of what the ads on TV tell you. Lack of high definition support is actually a requirement for the coupon program. For non-HD digital, such as the tube TV at my office, I picked up two Dish TR-40 tuners (link dead, just goes to Dish now) for $40 each. I bought my DTB-H260F for HDTV at home off of amazon.com. If you're interested in quality HDTV then an over the air tuner is the best way to get full rate HDTV, even in 2018. Cable and satellite operators will compress their HD channels in order to cram more channels into the service, which I've personally noticed are poor at fast motion compared to my OTA HD tuner. Do you have cable from Charter? Did you know you can get some HD channels for free if you have a QAM-capable tuner? Most HD tuners either as a standalone box (like my Samsung DTB-H260F) or one built-in to your HDTV can tune digital cable channels. Simply connect the cable and scan for channels in Cable "standard" or QAM mode. Charter should keep the local stations in the clear (i.e. not encrypted) but they don't advertise it. You'll also pick up any other digital cable channel that isn't encrypted, although the channels change randomly since you're seeing the behind the scenes channels and not the remapped user-friendly ones. KRNV is moving from channel 7 to channel 12 in mid-2020. KRXI moved from channel 44 to channel 23. KTVN moved from channel 13 to channel 11. KNPB is moving translator on channel 47 to 36 (Verdi and northwest Reno) and translator channel 42 to 22 (Truckee and Lake Tahoe). This site was origionally created to track the progress of HDTV in the Reno/Sparks area back in the early days of 2004. Since everyone now has digital transmitters, I don't expect there will be many major updates. However, this information is still useful. One of the benefits of an HDTV broadcast is Dolby Digital 5.1 sound. Whether or not you'll get DD5.1 depends on a few factors: the program must be produced with a DD5.1 audio track, the local station must pass the DD5.1 signal to you, and you need a receiver capable of decoding a DD5.1 signal. Otherwise, you will get the Dolby Digital 2.0 audio program. (It's all digital; just a function of how many audio channels you'll get.) Almost all of our local stations carry the Dolby Digital 5.1 audio program. Check out the Digital Television Shows Presented in Dolby Digital 5.1 (link dead) page for a list of programs that are produced in DD5.1 surround. Broadcasting in DD5.1 isn't as easy as you might think. In addition to all of the upgrades a station must go through to carry 720p or 1080i video, there's additional equipment required for multichannel audio. One of the engineers over at KTVN sent me a link that outlines the methods used by the various networks for their audio (archive.org, origional link dead). Simulcasting, also known as multicasting, is a feature of ATSC broadcasts to carry multiple channels on the same broadcast. Basically, it splits up the MPEG stream into sub-channels that can be tuned individually. Some stations utilize this effectively, and others, less so. The biggest drawback to adding more sub-channels is that it decreases the bandwidth available to the other sub-channels in the same broadcast; consequently, the image quality decreases as the number of subchannels increase. The reduction of quality is typically only detrimental to HD broadcasts. Some of our stations are utilizing subchannels to broadcast an SD version in addition to the HD version of the same programming. This takes bandwidth away from the HD broadcast. KNPB (PBS, channel 5) utilizes the subchannels to broadcast unique programming and expand their lineup. Broadcasting duplicate programming on subchannels is typically futile, as most (all?) set top boxes and tuners will convert the signal to whatever format is appropriate. However, this practice is widely accepted by most broadcasters at this time. The digital channels in Reno/Sparks are a mix of VHF and UHF stations, so you'll probably want to get a combination VHF/UHF antenna. However, depending on where you live, you might find yourself in the middle of the broadcast towers. In that case, you can use two antennas and combine then together using a splitter. You can see my antennas here. The VHF/UHF on top is pointing south, and the UHF grid below it is pointing north. Since they're both directional antennas, pointing them in opposite directions will reduce multipath. VHF includes channels 2 through 13 while UHF is channels 14 through 83. Keep in mind that you don't always need an antenna mast and large antennas; it depends on your location and personal preference. Some people elect to use outdoor antennas on a mast rather than have the antenna inside. A set of good old-fashioned rabbit ears will work for HDTV, too. Don't let someone fool you into thinking you need special (expensive) antennas to get an HDTV signal. The UHF grid is a Channel Master 3021. I don't know what the UHF/VHF one is, but it's similar to the Channel Master Advantage series. I recommend either Channel Master or Winegard antenna; the "special" Terk products have had mixed reviews, mostly negative. For indoor antennas, try finding one of those old Radio Shack double bow tie units or a Zenith Silver Sensor. The Silver Sensor has had many good reports and recommendations wherever I've read about it. Areas like Sun Valley, Panther Valley, Silver Springs, and Wingfield Springs may have trouble getting any of the channels off of Slide Mountain because of line of sight problems due to terrain. 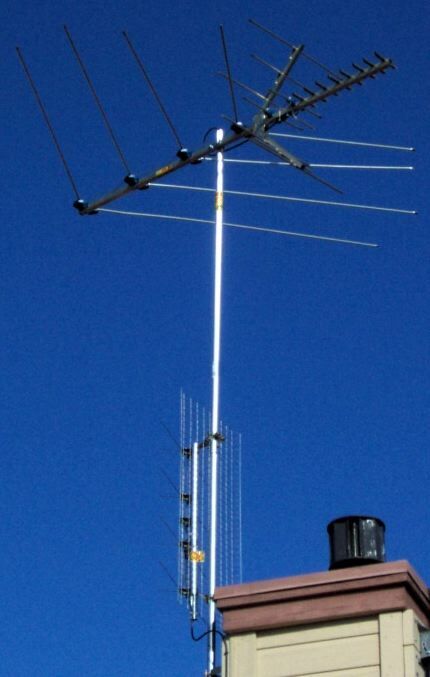 If you live there, or any of the other areas like it, you might want to try a good high gain outdoor antenna. Charter Communications offers HDTV in Reno. The general consensus is that cable HD ranks towards the bottom of the quality curve. I had the opprotunity to talk to a Charter rep a while back and he said that which HD channels they will carry and their quality is based on customer demand versus other services. Customer demand is currently preferring video-on-demand services and less HD, which causes HD to suffer with lack of channels and lower quality than an OTA tuner. If you are only interested in the local stations and don't care to purchase the HDTV package, many tuners are capable of tuning cable HD channels. This means if you already have cable, and a tuner that can tune QAM channels, you can get HD for free instead of paying for the HD package. This is available on all levels of service, including the basic analog package. Charter also offers CableCard access at a reduced cost, for HD tuners so equipped. VOD and the guide are not supported on CableCard. One anonymous reader had the following to say about Charter's HD service: "... I got the Charter HD package last month and haven't decided whether it's worth it to keep it. KTVN looks great, but KOLO doesn't really look any better than it's regular broadcast. Their HBO-HD and Showtime-HD are very clear with 5.1 Dolby Digital, but the picture gets pretty pixilated when there is a lot of motion. I have a Sony Wega, and I connected to the TV with component cables, so I'm guessing the problem with the picture is from their signal. Just doesn't seem worth the extra money." If you don't want to get service from Charter or want HD channels Charter doesn't carry you'll need to subscribe to Dish Network or DirecTV. If you can't pick up our local stations witn an antenna, and you already have Charter cable, the QAM versions of our local channels are available for free on your digital cable service. All you need is a cable-ready (QAM) ATSC tuner. The DTB-H260F can tune QAM channels. Charter now encrypts everything. Special thanks to Brant for providing numerous updates and information on the various channels in the Reno/Sparks broadcast area, and everyone else who has sent in tips. Special thanks also goes out to the engineering departments at KNPB, KTVN, and KRNV for providing information about their respective stations.